setting off the Camaro explosion, September 21, 1966. When Ford introduced the Mustang in 1964 there was no immediate reaction from General Motors, but by August of '64, just four months after the Mustang's introduction, GM realized the appeal of a four seat sports car. Ironically, the Mustang was created in response to the Chevrolet Corvair Monza! GM had actually begun preliminary work on such a car as early as 1958, according to Pontiac Designer Bob Porter. "I remember a four-passenger, sporty type car of the general size and weight class of the Mustang being worked on in an advanced studio. In the early '60s, similar cars were developed from time to time. Everyone wanted to do one, but at the time there was really no corporate interest." When the Mustang sold 100,000 units in the first six months, and almost half a million the first year, GM took an interest. 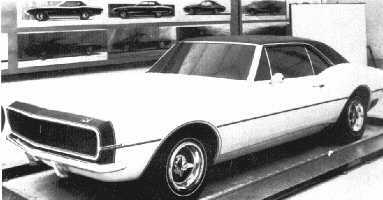 The responsibility for GM's Mustang fighter was given to the GM Design Center's Chevrolet Studio under the direction of Henry C. Haga. Interior design was directed by George Angersbach, who had been heavily involved in the design of the Corvette, Corvair, and the Chevy II, which became the Nova in 1968. It has long been a misconception that the '67 Camaro was designed from Chevy II components when actually it was the other way around. The Chevy II was to be all new for '68 and it shared many parts with the '67 Camaro, but this did lead to compromises in the design, most notably the cowl height and hood length. One unique feature was the decision to use a front subframe isolated with rubber 'biscuits" in combination with the unit body construction of the rest of the car, a technique that had been used on several European cars, including many Mercedes-Benz models. This combined the best of both worlds-a larger interior and more luggage space than was possible with a traditional frame and at the same time a quieter, smoother ride than a full uni-body car delivered. The designers did mock-ups of many different models, including a two-seat roadster, a fastback, and a station wagon. GM was trying to keep the cost as low as possible, however, to compete with the Mustang, and decided to stick with just two models, a coupe and a convertible. The Camaro was to be offered with a wide variety of powerplants, ranging from a 230 cubic inch six cylinder to a 327 V8. In addition, a new engine displacement was created just for the Camaro, a 350 cubic inch V8 rated at 295 horsepower. As the launch date neared, the car still had no name. It had been called various names by GM and the press, including Nova, Panther, Chaparral, and Wildcat (later used by Buick.) It is rumored that Chevy also considered using the letters "GM" in the name, and came up with G-Mini, which evolved into GeMini, and finally Gemini. General Motors Headquarters supposedly killed that name, because they didn't want the letters "GM" used in case the car was a failure. This pre-release car bears "Chaparral" name. 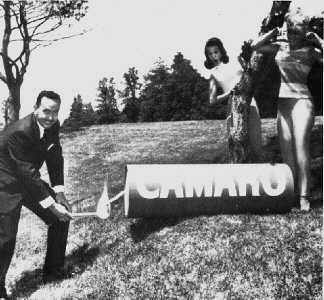 Finally, the car was introduced to the press as the Camaro, considered to be a good name because nobody knew what it meant. Chevrolet produced an old French dictionary showing that the word meant "friend" or "companion", but Ford found an alternate meaning in an old Spanish dictionary-"a small, shrimp-like creature. "The automotive press had a good laugh over that, and an even bigger one when one journalist found yet another meaning-"loose bowels." It didn't take long for the laughter to stop after the introduction of the stunning 1967 Camaro!